I have a dress, (well I have a lot, but this one is different. Well, new, oh shhhhhh) and I love this dress, I want to wear this dress to an event I have coming up soon but I am unsure how to dress it up. It is a gorgeous dress but I would call it one of those dresses you could either glam up or down. And here is my dress, modelled by Tallulah so that you can get a better look at how it sits. I'm not even sure whether to wear thick black tights with it. And the material in close up. 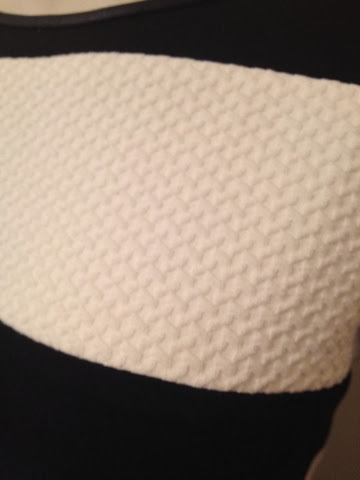 As you can see, the white sections are almost quilted. Talullah doing what she does best. How would YOU style this dress for an evening event? i would wear your green wig first of all! then pearls. nothing too busy as there are stripes already. black heels or white heels if you want to go 60's. i would do your eye makeup 60's though. this is already a bit of a statement so i would err on focusing on other areas, have fun! Red Blazer? Or Red Heels. then a gold chain and gold bangles. I love the dress, it has the 60s Mod vibe to me, so I'd play it up with some black knee high flat boots/white or black court shoes. Blazer because you don't want to freeze your bits off, and super glam earings.